A sculpture by a team of students from Parsons' School of Constructed Environments, on display at the International Contemporary Furniture Fair. Photo by Martin Seck. When HGTV had to list its “unique finds” from the International Contemporary Furniture Fair, Parsons was literally on the top of their list. 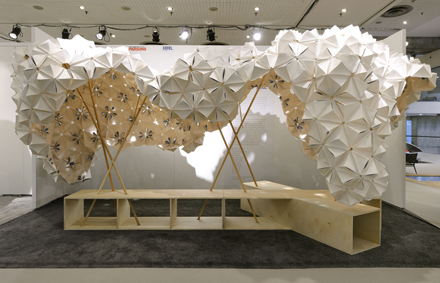 The first item in their ICFF roundup was an installation created by graduate and undergraduate students from the School of Constructed Environments which used Xorel, a Cradle-to-Cradle certified textile invented by Carnegie Fabrics, to make an undulating geometric canopy. “Imagine installing this in your outdoor space and hiding from the sun with a good book,” sighed HGTV. The ICFF was just one of many events involving Parsons students during Design Week NYC, which began on May 19. The Parsons Festival, the school’s annual series of events celebrating the creativity on campus, was in full swing, including an exhibition of thesis work and capstone projects from the School of Constructed Environments, which houses programs in architecture, interior design, lighting design and product design. Parsons students also took part in the “Design Students Challenge,” part of Wanted Design, an international exhibition of the best in design. A test of endurance, concentration, and the effectiveness of Red Bull, the three-day competition tasked its participants with taking one material, one conceptual tool, and one fabrication tool to design and construct a lighting design of their own invention. The participating team from Parsons includes Bland Hoke, an MFA Transdisciplinary Design graduate (2012), who has a background in public art and immersive installations; Caitlin Morris, an MFA Design + Technology graduate (2012), who has a background in architecture and perception research, as well as teaches fabrication workshops through Parsons dorkShop program; Alvaro Soto, an MFA Design + Technology graduate (2012); and Wang Junrui, a student in the dual degree Master of Architecture and MFA Lighting Design program at Parsons. At the end of the long weekend, the bleary-eyed contestants presented their work to be judged by the public and a jury of design professionals. In addition, Rama Chorpash, director of the Product Design program at Parsons, participated in the First Annual Core77 Open: All City All Stars, which featured work by designers from all five boroughs of the city.